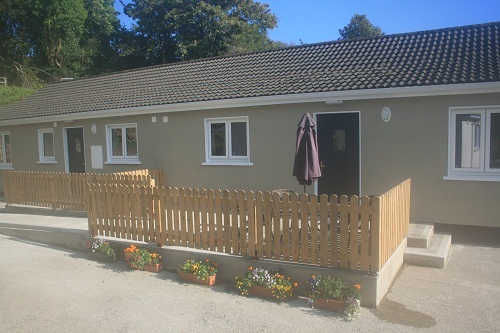 Holly and Hazel Cottages at Mountain View Lodge offer newly–built self-catering accommodation located in the Wicklow Mountains National Park just 3k outside the village of Laragh, 9K from Roundwood and a stone’s throw from the historic village of Glendalough with its world famous monastic site, interpretative centre and walks. The accommodation gives the visitor a wonderful base from which to explore all that the ‘Garden County’ of Wicklow has to offer. We are located within 1.5K of the famous Wicklow Way and many other walking routes for those who wish to enjoy the countryside and the spectacular views around Laragh, Roundwood and Glendalough. Set on almost 8 acres of wild meandering meadows, the visitor can enjoy stunning views over a 360 degree panorama of Brockagh Mountain, Scarr Mountain and the Glenmacnass Valley and a country walking trail of over 1Km on the property. The stunning Glenmacnass Waterfall is just 5K from us. The centrally-heated accommodation, approved to Failte Ireland 4*, comprises of 1 double bedroom with en-suite and 1 twin bedroom with en-suite, open plan living room/dining/kitchen (fully fitted), Freeview TV and a selection of DVDs and games/books. There is a patio area at the front and back with wonderful views and a separate heated drying room. There is a safe and secure, enclosed children’s playground on site with swings, slide and a climbing area and plenty of secure parking for cars, motorcycles and bicycles.